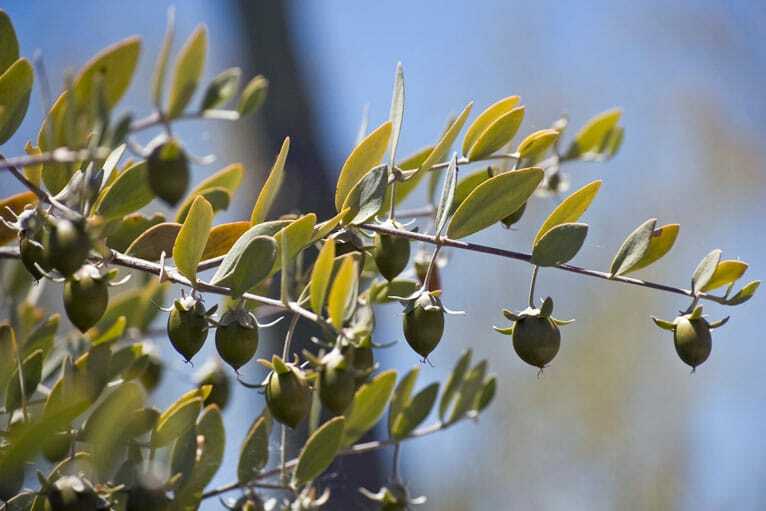 Jojoba oil is extracted by crushing the nuts of a desert tree. Jojoba oil is a natural oil crushed from the nuts of a desert tree native to the American Southwest. Egyptian jojoba oil tends to have more of the healing waxes than jojoba oil made from nuts of plants grown in Argentina or the USA. Jojoba oil is chemically similar to the sebum in human skin, and the oil can dissolve sebum and carry ingredients deep into the skin. Many products that use jojoba oil as a carrier, however, carry harmful ingredients deep into the skin. Jojoba beads are good for keeping unblemished skin clear. The best products for acne contain jojoba beads and very few other ingredients. You don’t have to buy an expensive acne skin care product, however, to take advantage of the healing properties of jojoba oil. If you want a good scrub for blemishes on the dry skin, for instance, just mix equal amounts of jojoba oil and cornmeal (about a tablespoon, or 15 grams, of each). Apply the mixture to blemished skin, rubbing it on your skin without trying to rub it into your skin, and then rinse away. This mixture costs just pennies per application, and is likely to be better for blemishes on dry skin than expensive products containing “jojoba beads.” Also, since you only use two ingredients, you don’t have to worry about any allergenic fragrances or harsh detergents damaging your skin. Aveeno Advanced Care Moisturizing Cream combines jojoba oil with glycerin, without adding any unneeded ingredients. The glycerin helps soothe sensitive skin, and the jojoba oil stimulates it to make the collagen it needs for repair. If you have a problem with both eczema and acne, this product will help with both skin issues, and it costs less than US $10 a bottle. Murad AHA/BHA Exfoliating Cleanser really wouldn’t work if it did not contain jojoba oil. In this product, jojoba oil makes the alpha-hydroxy acids, beta-hydroxy acids, and polyethylene exfoliating beads stick to the skin long enough to work. However, the jojoba oil sticks to your skin so well that you have to remove the product with a washcloth. MyChelle Fruit Enzyme cleanser contains a tiny amount of fruit enzymes with jojoba beads and bamboo powder. It’s actually the jojoba beads and bamboo powder that cleanse your skin. Peter Thomas Roth Anti-Aging Buffing Beads use jojoba beads to break up tight, dead skin that keeps pores closed. This product is best for keeping unblemished skin clear. The beads won’t really dissolve in the sebum in your pores the way pure jojoba oil will, so they are best for keeping dead skin and dried sebum from building up on clear skin. Zia Ultimate Deep Pore Cleanser is also a product that is better for keeping skin clear than it is for clearing up blemishes. The jojoba beads in this product can break up tiny amounts of hardened sebum, but they only get stuck in the oily skin or large pores. Never scrub blemishes, especially with something coarse like cornmeal! Thank you for this tip , very helpful .